Firefighters at Station One return from a call Wednesday night as the news is announced that a new contract for Local 693, which includes pay cuts, was approved by the union. 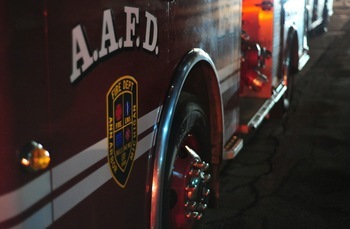 The jobs of 13 Ann Arbor firefighters were spared Wednesday night as the membership of Local 693 voted to ratify a new labor contract that includes a voluntary pay cut. Union president Matt Schroeder said Local 693 members accepted a compensation package that included a 4 percent decrease in wages and a guarantee of no reductions in force through June. He pointed out the new agreement offers the city significant savings - beyond what the mayor asked for at a recent meeting. Mayor John Hieftje has asked all of the city's labor unions to agree to take a voluntary 3 percent pay cut in the next year to help the city confront a multimillion-dollar budget deficit. "Our membership realizes the financial crunch that our city faces and further realizes the importance of the department continuing to provide our current minimal basic services," Schroeder said. Schroeder said while firefighters were willing to take a pay cut for the greater good of the city, considering future cutbacks that include station closures and reductions in force should not be acceptable. "The public's safety weighed heavily in our decision-making process, and we hope it will also weigh heavily on the minds of our politcal leaders in the near future as we continue through this difficult period," he said. "We continue to look at ways to maintain the current protection in July and are looking for ways to problem solve with our leaders." City Administrator Roger Fraser agreed to postpone the layoff of 13 firefighters for another six months, pending ratification of the new contract. Several fire engines were parked outside Station One in downtown Ann Arbor Wednesday night during voting on the new Local 693 contract. All of the trucks left in unison shortly before 8 p.m., sounding their sirens as they headed to a call. Schroeder said the union doesn't disclose vote counts, but a significant number of the 80-plus firefighters who voted were in favor of ratifying the contract. He said the city's firefighters have led by example and expect other labor unions and top city officials to follow suit. "Our membership has shown its committment to our citizens by leading our peers and leadership in tough cuts," he said. "The consensus from our local is that we would hope that council and the administrator would follow our lead in accepting a 4 percent cut." 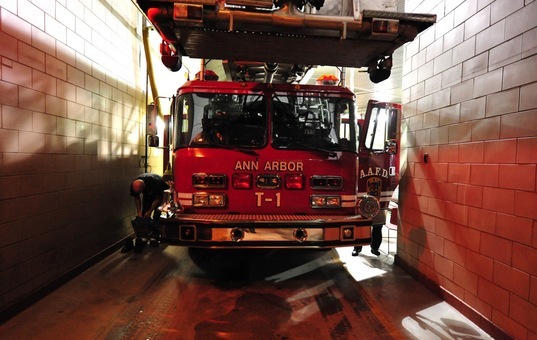 Based on a report showing base wages for Ann Arbor firefighters totaled $6.22 million last year, the city stands to save at least $249,000 a year from the 4 percent reduction. Another $509,687 was paid out in overtime and banked comp time last year, a figure that could go down, too. Sirens sounded at Station One downtown shortly before 8 p.m. Wednesday as several trucks outside the station left in unison to respond to a reported fire. Some firefighters made their way out on foot to go celebrate the contract's passage. "We were two of the ones getting laid off," said Jon Lukosavich, joined by fellow firefighter Michael DeCraene. The two, who will keep their jobs for at least six more months now, acknowledged there was a lot of uncertainty going into the vote since a voluntary pay cut required a gesture of good will on the part of firefighters with seniority in the union. "It was good to see we were able to pull together," Lukosavich said. "This says that our department's willing to take a pay cut to help the city and help the citizens and make this a better city to live in. That's what we're here for is to help people. I think taking the pay cut shows that we're willing to do that. We realize that we're in tough times, so we're willing to make our sacrifice as long as everybody else makes a sacrifice, too." The firefighters union had been without a contract since last June. The new agreement covers a one-year period from July 1, 2009, through June 30, 2010, meaning negotiations likely will pick up again this spring to hammer out a longer-term contract to carry the department beyond the current fiscal year. It's not yet known what will happen to the 13 firefighters after June. Another position remains vacant, for a total of 14 positions possibly on the line. "We just hope we can work with the city in the future and we can come up with an agreement to keep our citizens safe and keep us firefighters safe, and still provide a high level of service," DeCraene said. "It's important that the citizens have the staffing levels remain the same." The elimination of 14 firefighters was included as part of the plan for cutting costs in the next fiscal year budget starting in July. But Fraser last month proposed moving the layoffs up to January to save an extra $400,000 this current fiscal year. The city had projected general fund revenues of $86 million this year and now expects $82 million. Next year, the city had expected general fund revenues of $83 million, but now expects an amount closer to $76 million. Fraser gathered city employees under the roof of the Michigan Theater on Tuesday to deliver news of the city's grim budget picture. At that meeting, Fraser encouraged the city's workers to try their best to stay positive and said he and other city leaders, including Ann Arbor City Council members, will do their best to make the right choices as the city looks to trim its struggling budget by millions of dollars. With police and fire services accounting for about half of the city's general fund budget, cuts in those areas are inevitable, city leaders say.